Provide comfort for the family of Donna Burns with a meaningful gesture of sympathy. 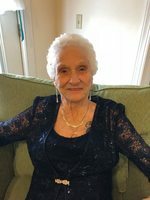 Donna Ann Burns passed away February 27th 2019 surrounded by her family and loved ones. Donna married Chester M. Burns on October 5th 1957. Donna and Chester were married for 58 years before he passed away and she missed him greatly. Donna was well known for her beautiful nails, receiving compliments every where she went. She enjoyed crocheting that her daughter Cindi taught her how to do, camping, collecting porcelain dolls, and she made the best spaghetti sauce in Knox County. She sewed a lot of her children's clothing throughout the years including her sister Vicki's wedding dress. She looked forward to receiving a new Anna Lee doll from her daughter Sherri every year for her birthday. Sherri enjoyed moving furniture with her mother even though they typically only made it half way up the stairs before they would burst out laughing. Sharel Ann and Donna went to a female impersonator show when visiting Sharel Ann in Virginia, in which instead of Donna tipping the performer, he tipped her. She also enjoyed her visits to Virginia where she went out to eat every day and shopping. Cindi looked forward as a little girl selling Avon with her mother as that was their special one on one time together. Chad and Donna always got excited about their moose hunts together, which there were many. The grandchildren all have fond memories of huge holiday gatherings where Donna put on quite a spread. Donna worked several years as a sardine packer and then performed clerical duties for a local seafood company. She was also an Eastern Star member. Donna and her daughters picked crabmeat every summer so that she could provide a wonderful Christmas for her family. She loved old time country music, being an avid bargain shopper, and she enjoyed following her family and friends on Facebook. Donna is predeceased by her husband of 58 years Chester M. Burns, a son Chester M. Burns Jr., her father Joseph McGuire, her mother Ruth Wellman McGuire, two brothers Johnnie and JoJo, a sister Joan, and a great great granddaughter Aileana Roselyn. Donna is survived by her five children, daughter Sherri and her husband Butch Taylor from Cushing, daughter Sharel Ann and her husband Kenneth Kearly, II from Chesapeake, VA, CIndi and her husband Stewart Campbell from Waldoboro, and a son Chad and his wife Michele Burns from Waldoboro, and step-son Buddy Pietila of Nobleboro. 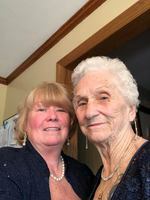 She is also survived by 14 grandchildren and 25 great grandchildren, a sister Vicki and her husband Glenn Grachien from Searsmont and a sister Joni Lynn and her husband Robert Blair from Liberty along with several nieces and nephews. Visiting hours will be held from 1-2 p.m. on Tuesday, March 5, 2019 with a funeral service to follow at 2:00 p.m. to be held at Hall’s of Waldoboro, 949 Main Street, in Waldoboro, with Pastor Tom Rawley officiating. Burial will be in the spring at the Harbor View Cemetery in Friendship. Provide comfort for the family of Donna Ann Burns by sending flowers.